Helically chiral spirocyclic P3 phosphazenes were designed as a novel family of chiral organosuperbases. The newly designed chiral P3 phosphazenes were synthesized from commercially available sources in several steps and characterized by X-ray crystallographic analysis of their onium salts. 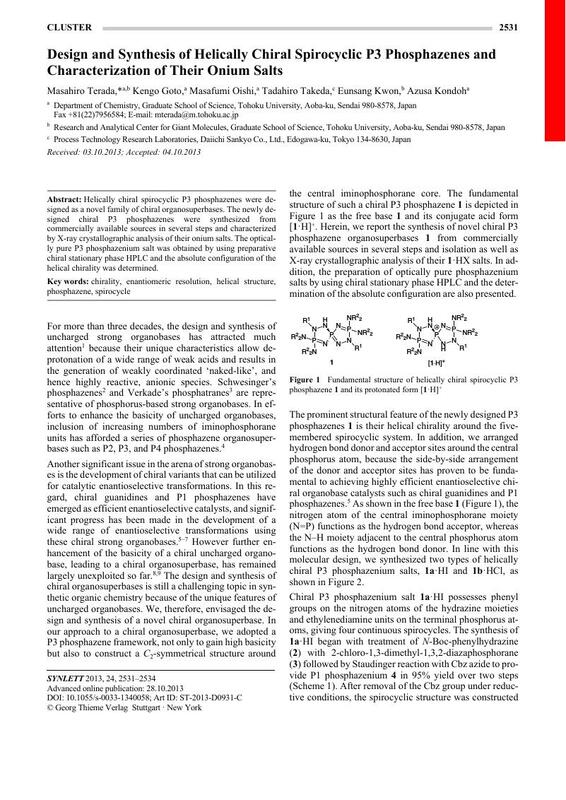 The optically pure P3 phosphazenium salt was obtained by using preparative chiral stationary phase HPLC and the absolute configuration of the helical chirality was determined. 10 The enantiomers of (±)-1a·HBF4 were resolved by using analytical HPLC equipped with a Daicel CHIRALPAK IB (MeOH–Et2NH = 100:0.1, 1.0 mL/min, 240 nm, 40 °C): t R = 23.3, 26.0 min. See Supporting Information (page S14). 11 CCDC-964338 [(±)-1a·HI] contains the supplementary crystallographic data for this paper. These data can be obtained free of charge from The Cambridge Crystallographic Data Centre via www.ccdc.cam.ac.uk/data_request/cif. 12 The enantiomers of (±)-1b·HCl were resolved by using analytical HPLC equipped with a Daicel CHIRALPAK IB (MeOH–Et2NH = 100:0.1, 1.0 mL/min, 240 nm, 40 °C): t R = 29.9 (isolated), 33.5 min. See Supporting Information (page S18). 13 The second peak could not be isolated in an optically pure form because of overlap with the first peak under the preparative chiral stationary phase HPLC conditions. 14 Specific rotation of the first eluting enantiomer, (+)-1b·HCl: [α] d 27 +91.7 (c 0.90, CHCl3). 15 CCDC-964339 [(±)-1b·HBr] contains the supplementary crystallographic data for this paper. These data can be obtained free of charge from The Cambridge Crystallographic Data Centre via www.ccdc.cam.ac.uk/data_request/cif.